The Burrard Inlet Marine Enhancement Society based at Mossom Creek in Port Moody, BC Canada, has launched a Marine Based Public Art project in collaboration with J Peachy Gallery. As the Artist in Residence for the Society my goal is to engage in creative dialogue around the local ecosystem and marine conservation within Burrard Inlet. The long term vision is to create a permanent Marine Based Art Gallery in the Burrard Inlet. 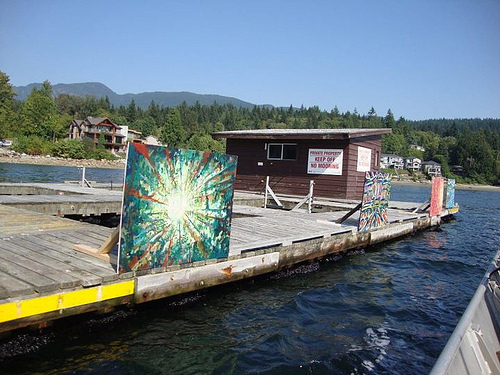 Each year there will be two art rotations on the Mossom Creek Seapen just offshore from the IOCO townsite. This will coincide with critical periods of the Out and In Migration periods of local Wild Salmon. The Gallery is only accessibly by water and ideally by human or natural powered means. While powered boats can float up to the installations, the experience is different and not what is intended. Paddling from local launch points is part of the experience and dialogue, and the viewpoints of the art work and descriptions is better suited for crafts closer to the waterline. In addition, paddling generates less wake and the reflections on still waters has a unique effect. In fact a couple of the pieces make deliberate use of it. The Port Moody Inlet is the final open water destination for In-Migrating Chum and Coho Salmon, who return every fall from 2-4 years the open ocean. In BC, Millions of Salmon return to local rivers, streams and tributaries where they spawn and start a new cycle of life. The intersection and interconnection of people and the natural environment are ongoing themes of exploration for me. I seek opportunities to have a direct and unstructured engagement in these physical realms. I think its a place where people can be extracted from the comfort spaces which have been defined by other people. Hopefully, it can generate a moment where one can be left to think freely. 26 x 48 Acrylic on reclaimed panel Rocky Point Park in the Port Moody Arm of the Burrard Inlet and is a popular launch point for boats, kayaks and sailboats. Salmon return each fall after there 4 year ocean journeys to come and spawn in local creeks where they started their lifecycle. ‘Making the Point’ has a double meaning in that the Salmon swim by the park (Rocky Point) prior to their final run into fresh water creeks. In addition it reflects the intended dialogue by juxtaposing Professional Gallery Artworks outside within the elements, hence making the point about what lives within the inlet and encourge people to think about how their actions on the water reflect that. The Vancouver Art Gallery lawns have been home to many environmental rallies over the years. This painting was created on the lawns of the Art Gallery in August 2011. It also asks the question if Salmon had their own art gallery what would they want it to say? This piece was created by Artist Melanie Schambach at a recent Art Retreat at Mossom Creek Hatchery. Inspired by the cycle of life of Salmon and how they decompose in the forest after being consumed by bears and wolves it depicts the view of these deceased fish. Continuing with the theme of the cycle of life of trees and Salmon. This installation is made from reclaimed lumber and showcases the futile attempt by man to re-create nature. Can the manmade be as good as the natural? Even the broken smile of a re-constructed Tree shows its amusement towards mans feebleness in its attempt to recreate Wilderness. Reflecting on the personal story of Artist J Peachy and his mental health struggles and dedicated to the environment around Mossom Creek helped restore his life. The metaphor of the rings of a tree to life are also expressed in words, here. This was created with reclaimed t-shirt fabric and inspired by a friends do-it-yourself fashion studio. In 2010, Wild Sockeye returned to the Fraser River in historic numbers, after a steady decline over almost 20 years. In Fall 2010 Sockeye Salmon was widely available and cost effective for everyone to consume. thus, it now became fashionable to talk about these fish. The Burrard Inlet Salmon pass by Siwash Rock on their final journey back to the Port Moody Arm, however some don’t make it back and are consumed by predators. This Eagle anticipates a lovely meal, wondering what he would pair with it? This diptych is analagous to a road divided by a double solid line and rush hour traffic. In the spring Salmon go out towards the Ocean, while in the Fall they return. During the off peak times, other aquatic creatures swim and reside in the creek, however will need to get out of the way come the rush hour when millions of Salmon return to the rivers, streams and tributaries of British Columbia. for more info go to mossomcreek.org. For more photos on the project go to this link. To make a donation to the Paddle Gallery project and other arts based marine conservation programs, please contribute to the link below.